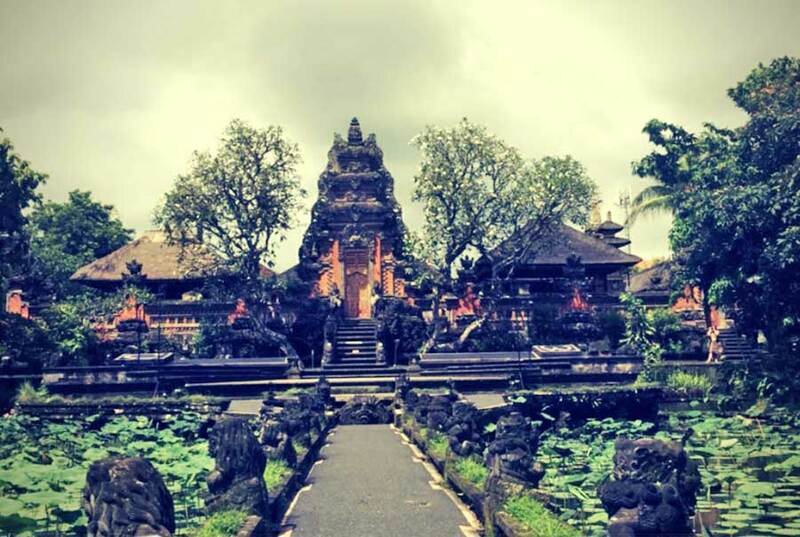 If you are interested in seeing the beauty of temple architecture and want to watch the balinese dance performance, Taman Saraswati temple is one of the Ubud attractins that you must visit. The Taman Saraswati Temple is dedicated to the goddess Sarasvati (Goddess of Science), with the beauty of the carving art typical of local residents of Ubud, Bali. This temple is also an authentic proof of how religious life is carried out daily by Hindu communities on the island of Bali. Taman Saraswati temple has a very beautiful design, with gardens and there is a pond filled with lotus plants. This lotus pond blends harmoniously with the beauty of the temple which is full of ornaments carved. So artistic and very beautiful with a strong spiritual impression. This lotus pond with an artistic gate of the temple background is the main attraction of Pura Taman Saraswati. Besides the lotus pond, every day except Friday at Saraswati Ubud Temple there is also a Balinese dance performance such as Kecak dance. Stage performances are surrounded by lotus ponds. The schedule for this dance performances is held at night, starting at 19.30 and each day perform with a different dance. Many visitors said Taman Saraswati temple is the best place to see Balinese dance performances at night. Construction of Taman Saraswati Temple started in 1951 and was completed in 1952. The temple was built by I Gusti Nyoman Lempad following a commission by the Prince of Ubud Cokorda Gede Agung Sukawati. I Gusti Nyoman Lempad is a famous art maestro from Ubud. He was employed by the Sukawati royal family and built several palaces and temples in Ubud and the neighboring villages. The Saraswati temple location is on Jalan Kajeng, Ubud. The temple location is close to Lotus Cafe. If you depart from Kuta Beach Bali heading to the Saraswati temple Ubud, it will take approximately 1 hour 30 minutes to travel.